The Net had plenty to offer this morning on the political life and death of Saddam Hussein. The strange tale of his ‘creation’ and ‘destruction’ by the same forces… It almost sounds like novel written by Mary Shelly of ‘Frankenstein’ fame. Saddam to the gallows. It was an easy equation. Who could be more deserving of that last walk to the scaffold – that crack of the neck at the end of a rope – than the Beast of Baghdad, the Hitler of the Tigris, the man who murdered untold hundreds of thousands of innocent Iraqis while spraying chemical weapons over his enemies? Our masters will tell us in a few hours that it is a “great day” for Iraqis and will hope that the Muslim world will forget that his death sentence was signed – by the Iraqi “government”, but on behalf of the Americans – on the very eve of the Eid al-Adha, the Feast of the Sacrifice, the moment of greatest forgiveness in the Arab world. But history will record that the Arabs and other Muslims and, indeed, many millions in the West, will ask another question this weekend, a question that will not be posed in other Western newspapers because it is not the narrative laid down for us by our presidents and prime ministers – what about the other guilty men? No, Tony Blair is not Saddam. We don’t gas our enemies. George W Bush is not Saddam. He didn’t invade Iran or Kuwait. He only invaded Iraq. 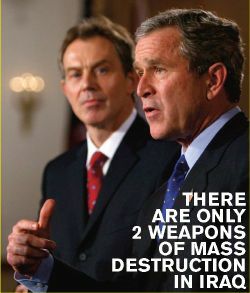 But hundreds of thousands of Iraqi civilians are dead – and thousands of Western troops are dead – because Messrs Bush and Blair and the Spanish Prime Minister and the Italian Prime Minister and the Australian Prime Minister went to war in 2003 on a potage of lies and mendacity and, given the weapons we used, with great brutality. In the aftermath of the international crimes against humanity of 2001 we have tortured, we have murdered, we have brutalised and killed the innocent – we have even added our shame at Abu Ghraib to Saddam’s shame at Abu Ghraib – and yet we are supposed to forget these terrible crimes as we applaud the swinging corpse of the dictator we created. Who encouraged Saddam to invade Iran in 1980, which was the greatest war crime he has committed for it led to the deaths of a million and a half souls? And who sold him the components for the chemical weapons with which he drenched Iran and the Kurds? We did. No wonder the Americans, who controlled Saddam’s weird trial, forbad any mention of this, his most obscene atrocity, in the charges against him. Could he not have been handed over to the Iranians for sentencing for this massive war crime? Of course not. Because that would also expose our culpability. And the mass killings we perpetrated in 2003 with our depleted uranium shells and our “bunker buster” bombs and our phosphorous, the murderous post-invasion sieges of Fallujah and Najaf, the hell-disaster of anarchy we unleashed on the Iraqi population in the aftermath of our “victory” – our “mission accomplished” – who will be found guilty of this? Such expiation as we might expect will come, no doubt, in the self-serving memoirs of Blair and Bush, written in comfortable and wealthy retirement. Hours before Saddam’s death sentence, his family – his first wife, Sajida, and Saddam’s daughter and their other relatives – had given up hope. “Whatever could be done has been done – we can only wait for time to take its course,” one of them said last night. But Saddam knew, and had already announced his own “martyrdom”: he was still the president of Iraq and he would die for Iraq. All condemned men face a decision: to die with a last, grovelling plea for mercy or to die with whatever dignity they can wrap around themselves in their last hours on earth. His last trial appearance – that wan smile that spread over the mass-murderer’s face – showed us which path Saddam intended to walk to the noose. I have catalogued his monstrous crimes over the years. I have talked to the Kurdish survivors of Halabja and the Shia who rose up against the dictator at our request in 1991 and who were betrayed by us – and whose comrades, in their tens of thousands, along with their wives, were hanged like thrushes by Saddam’s executioners. I have walked round the execution chamber of Abu Ghraib – only months, it later transpired, after we had been using the same prison for a few tortures and killings of our own – and I have watched Iraqis pull thousands of their dead relatives from the mass graves of Hilla. One of them has a newly-inserted artificial hip and a medical identification number on his arm. He had been taken directly from hospital to his place of execution. Like Donald Rumsfeld, I have even shaken the dictator’s soft, damp hand. Yet the old war criminal finished his days in power writing romantic novels. It was my colleague, Tom Friedman – now a messianic columnist for The New York Times – who perfectly caught Saddam’s character just before the 2003 invasion: Saddam was, he wrote, “part Don Corleone, part Donald Duck”. And, in this unique definition, Friedman caught the horror of all dictators; their sadistic attraction and the grotesque, unbelievable nature of their barbarity. But that is not how the Arab world will see him. At first, those who suffered from Saddam’s cruelty will welcome his execution. Hundreds wanted to pull the hangman’s lever. So will many other Kurds and Shia outside Iraq welcome his end. But they – and millions of other Muslims – will remember how he was informed of his death sentence at the dawn of the Eid al-Adha feast, which recalls the would-be sacrifice by Abraham, of his son, a commemoration which even the ghastly Saddam cynically used to celebrate by releasing prisoners from his jails. “Handed over to the Iraqi authorities,” he may have been before his death. But his execution will go down – correctly – as an American affair and time will add its false but lasting gloss to all this – that the West destroyed an Arab leader who no longer obeyed his orders from Washington, that, for all his wrongdoing (and this will be the terrible get-out for Arab historians, this shaving away of his crimes) Saddam died a “martyr” to the will of the new “Crusaders”. When he was captured in November of 2003, the insurgency against American troops increased in ferocity. After his death, it will redouble in intensity again. Freed from the remotest possibility of Saddam’s return by his execution, the West’s enemies in Iraq have no reason to fear the return of his Baathist regime. Osama bin Laden will certainly rejoice, along with Bush and Blair. And there’s a thought. So many crimes avenged. But we will have got away with it. Let this be a lesson for all employees of empire. Step out of line and we will hang you. Saddam was a good employee when we needed him. He gave Iran hell for many many years using the weapons that we bought for him. That he tried them out within his own borders is a very small question of jurisdiction, isn’t it? He’s not on trial for the millions of Iranians he killed in his role as U.S. proxy dictator. We certainly won’t be hearing those statistics in the western media, will we. If we were smart, which we are not, we would give him his old job back and put a strong reprimand in his file. Every employee deserves another chance. For everything that Saddam has done for empire, we should repay him honestly with a comfortable retirement just like we do for all our other employees. Going round the bend, teetering on the edge. Behind an enormous object whose jaws rumble. Was it worth your capture? Your death sentence? Now there is a larger thing haunting your land and people. But it is not God. No. It is not Allah. It is empire. Shall haunt you for eternity. Clambering across the wilderness, devouring children. Or sing out in a reverent verse for mankind! While the rats fill their lungs with tears.